Washington (CNN) – Commenting on the high-temperature political rhetoric of the last week and some incidents of violence and threats against lawmakers, a leading Senate Republican walked a fine line Sunday. 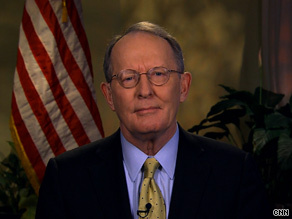 Appearing on CNN’s State of the Union, Sen. Lamar Alexander, R-Tennessee, said “ugliness” ought to be condemned. And, at the same time, the Tennessee Republican said the nation’s leaders needed to “respect” the anger some have about the direction the country is headed in. “There's no doubt there has been - the anger today is more visible,” Alexander told CNN Senior Political Correspondent Candy Crowley. “You can go to any Web site and see ugliness. It used to be beneath the surface and it's on top now, and it ought to be condemned. Related: Anger over health care bill a sign of the times? Sen. Barbara Mikulski, D-Maryland, agreed with Alexander and had detailed advice about how to cool down the country’s political rhetoric. We interrupt the Sunday programs with this just in: President Obama took a dark-of-night secret journey to Afghanistan for talks with Afghan President Hamid Karzai and a salute to U.S. troops. Meanwhile, back on the set, Washington was in the dark, or left in the dust, whichever you prefer. At any rate, nobody knew about the trek until most of the shows were over and the President landed in Kabul, making coverage of the story limited. Notable but not quite soundbiteable this Sunday. 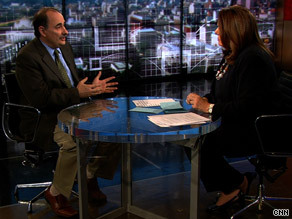 Check out Senior White House advisers David Axelrod and Valerie Jarrett on U.S.-Israeli relations lately. It sounds like they are dialing back the public expressions of U.S. anger at Israel for approving new construction in disputed territory. It’s pretty nuanced if real, but it IS the Middle East we’re talking about. I’m half expecting calmer, nicer, less tense pronouncements as we head into Easter week. But Sunday talk was mostly domestic – health care reform and the civility of the debate thereof. Turns out the whole health care reform debate didn’t get settled with the bill’s passage. It got moved to another venue: from the legislative arena to a wholly political one. Bagram Air Base, Afghanistan (CNN) - President Barack Obama rallied coalition forces in Afghanistan during a previously unannounced visit Sunday, telling them the 8-year-old war remains "absolutely essential" to the security of the United States. (CNN) - President Barack Obama pledged continued U.S. partnership with Afghanistan during a previously unannounced trip to the country Sunday. In remarks after meeting with Afghan President Hamid Karzai, Obama said he wanted to send a "strong message" that the partnership between the nations would continue. Obama said he invited Karzai to Washington, and White House Press Secretary Robert Gibbs said the planned date for that visit is May 12. Republican Sen. Lamar Alexander said Sunday that the president's plan for recess appointments has thrown 'fuel on the fire' at a time of already angry political debate in the country. Washington (CNN) – A leading Senate Republican said Sunday that his chamber’s failure thus far to act on a number of President’s Obama’s nominees was consistent with the constitutional scheme of government intended to keep the executive branch in check. Obama announced plans Saturday to appoint 15 nominees while the Senate is in recess. Among the 15 is one especially controversial pick for the National Labor Relations Board, the federal agency that weighs in on those labor-management disputes governed by federal law. 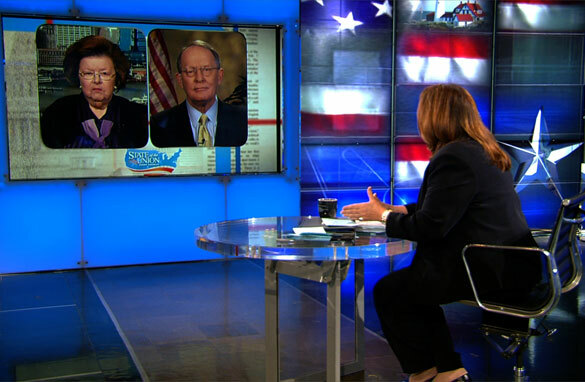 Asked on CNN’s State of the Union about Democratic claims of Republican obstructionism in the Senate, Sen. Lamar Alexander, R-Tennessee, said his party was helping to fulfill the Senate’s traditional role in a divided government. Washington (CNN) - A Republican-led effort to block President Barack Obama's nominations for top federal jobs made it necessary for the 15 recess appointments announced by the White House, Obama's senior adviser said in an interview broadcast Sunday. "We have 77 appointees who have not gotten the (Senate) vote because they have been held up by the Republican Party," Axelrod said. "Some of them are in very sensitive positions – Treasury, Homeland Security, and boards like the Labor Relations Board . . . where there are a huge number of vacancies." (CNN) - President Barack Obama made a surprise trip Sunday to Afghanistan where he met with Afghan President Hamid Karzai. Obama left his Camp David retreat for the previously unannounced trip and flew to Afghanistan on Air Force One, landing at Bagram Air Base at 7:24 p.m. (around 11 a.m. ET). 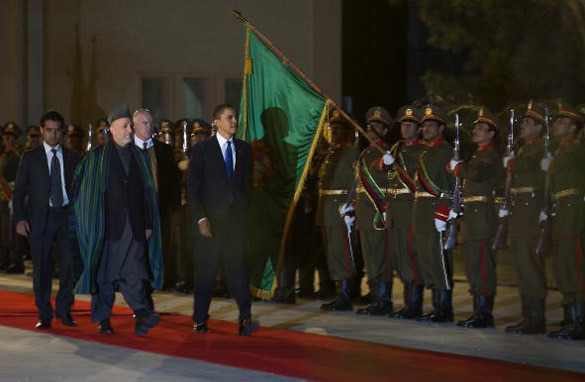 Obama then flew on a helicopter to the Presidential Palace for a meeting with Karzai. The two presidents took part in a 10-minute arrival ceremony before walking into the palace. U.S. officials said they planned to hold a one-on-one meeting first, joined by key aides, and then bring in Karzai's cabinet. Obama senior adviser David Axelrod told CNN that recent reports of threats and violence should not overshadow the administration's accomplishments in the last week. Washington (CNN) – A senior adviser to the president said his party was not out of bounds in issuing fundraising appeals linked to recent threats of violence against congressional Democrats. Obama senior adviser David Axelrod also suggested congressional Republicans bore some responsibility for the overheated rhetoric and incidents of vandalism directed at Democrats. After multiple incidents of violence and threats directed at the offices and even the homes of some Democrats who voted for the recently passed health care legislation, the Chairman of the Democratic National Committee and the head of President Obama’s grassroots political operation both sent fundraising messages to supporters that mentioned the recent incidents. 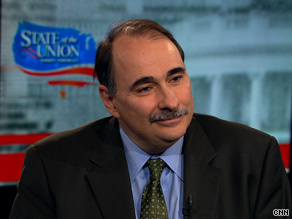 Axelrod, who is widely credited with crafting Obama’s messaging during the presidential race, also suggested to CNN Senior Political Correspondent Candy Crowley that there is a “cause and effect” relationship between some of the rhetoric congressional Republicans used in the final days of health care debate and the recent violence and threats. 'Israel is a close, dear, and valued friend of the U.S., a great ally,' Obama adviser David Axelrod said. Washington (CNN) – The president’s recent closed-door meeting with Israel’s prime minister - which lacked the fanfare and niceties normally associated with greeting another world leader - was a working meeting where issues in the U.S.-Israeli relationship were discussed bluntly, White House senior adviser David Axelrod said. Asked about the low-key way in which Israeli Prime Minister Benjamin Netanyahu was greeted at the White House last week, Axelrod dismissed any suggestion that the lack of formalities was intended to send a message to Israel. 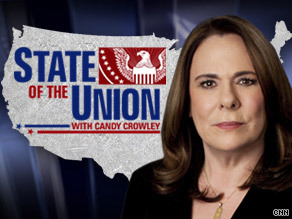 “[T]here was no snub intended,” Axelrod said in an interview that airs Sunday on CNN’s State of the Union.